Heat oven to 350°F. Spray 8x4-inch loaf pan with cooking spray. In large bowl, mix beef, spinach purée, crushed crackers, onion, 2 tablespoons of the ketchup, the Worcestershire sauce and egg. Press mixture in pan. Bake 50 minutes. Remove from oven and carefully drain liquid from pan. Spread remaining 4 tablespoons ketchup over top of meatloaf. Bake about 10 minutes longer or until meat thermometer inserted in center of loaf reads 160°F. Let stand 10 minutes before serving. Prepare and shape the meatloaf in advance; cover and refrigerate up to 8 hours. Bake as directed. 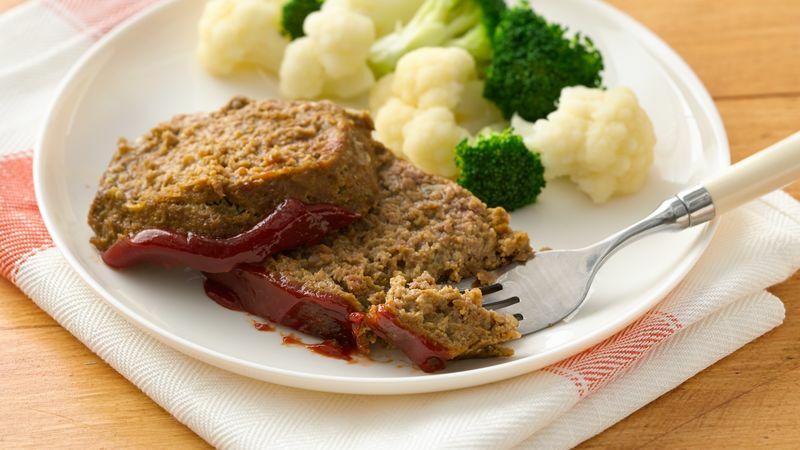 Vegetable purée can be added to your favorite meatloaf recipe. Just use 1 pouch of purée in place of the milk or liquid in your recipe.